A selection of crowns through the ages from those worn by Egyptian pharaohs through the Romans and Byzantines, the Saxon kings and Henries the Third and Fifth up to Prince Charles. 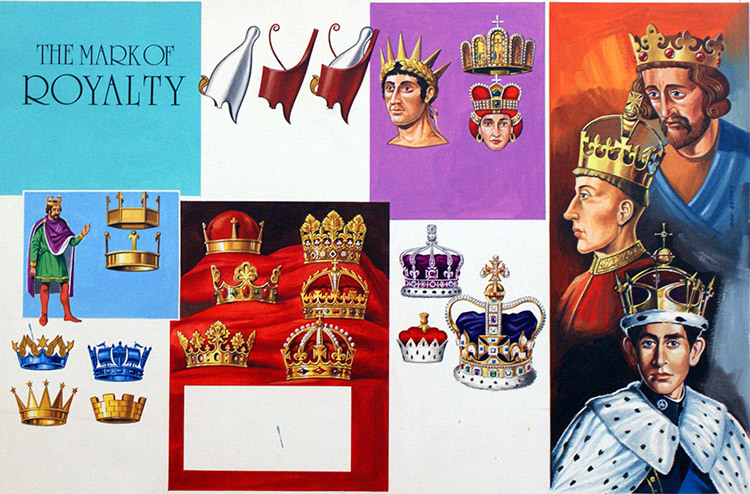 The large crown with the purple cloth is St. Edward's Crown and was made for the coronation of Charles II. It is the Crown of England and as it weighs nearly five pounds it was only worn for a few minutes by Queen Elizabeth II during her coronation. The earlier English crowns were all destroyed after the execution of Charles I. 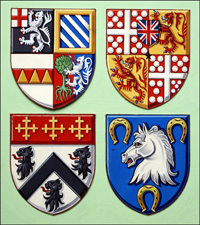 This is the original artwork by Dan Escott, a specialist in heraldry and related illustrations, was created for the World of Wonder Annual 1974.